General Douglas MacArthur (January 26, 1880 - April 5, 1964) was an American General who served in World War I, World War II, and the Korean War. Twice forces under his command suffered large defeats. 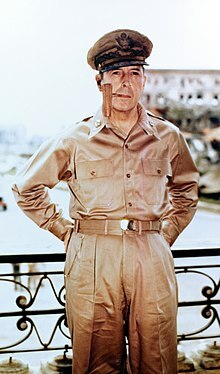 In 1941 he became Commander of United States Army forces in the Far East. From December 1941 to April 1942 the Japanese Army conquered the Philippines. He fled, but later returned leading a victorious army. In 1950 he led United Nations forces in Korea. The Chinese defeated them at the Chosin Reservoir in North Korea. After making several comments towards superiors questioning their actions, he was relieved from command on April 1951 by President Harry S Truman He was born in Little Rock, Arkansas, in 1880 and died in Washington, D.C., in 1964. ↑ "The Redacted Testimony That Fully Explains Why General MacArthur Was Fired". Smithsonian. Retrieved 2018-03-17.